Information in this article is subject to change as necessary. OpenJDK (Open Java Development Kit) is an open source implementation of the Java Platform, Standard Edition (Java SE). The upstream community project OpenJDK is currently sponsored and led by Oracle and is released under the GNU General Public License (GNU GPL 2 and 2+) with a linking exception. Oracle leads development of the Java Platform SE and contributes heavily to the OpenJDK project. Red Hat is one of the top non-Oracle contributors to the project. See Overview and Development model of Java Platform SE for more details. 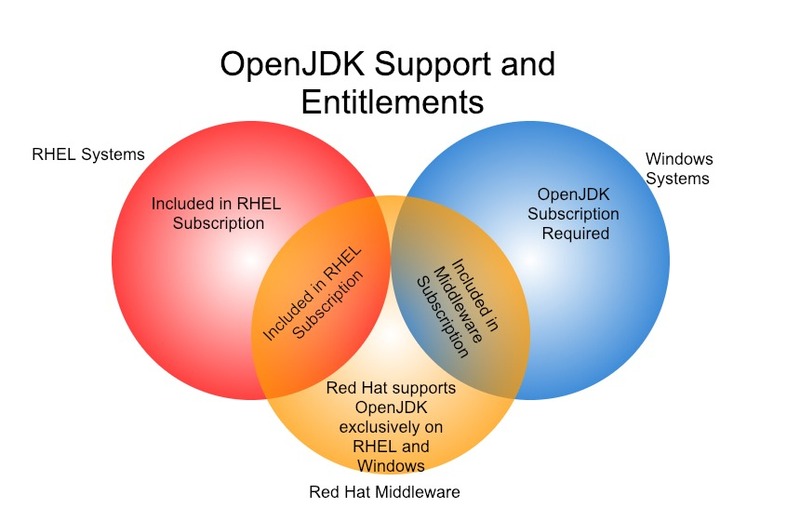 The following section outlines the scope of support for OpenJDK from Red Hat. A major version of OpenJDK is supported for at minimum a period of six years from the time it is first introduced by Red Hat. OpenJDK versions can fall out of support on versions of RHEL if the retirement date of the underlying RHEL platform precedes the retirement date of the OpenJDK version. There are currently three active major versions available in RHEL, but customers are advised to migrate to the newest version of OpenJDK as soon as practical to continue to receive updates and support. Red Hat will deliver four updates per year, approximately three months apart, for the OpenJDK 8 and 11 distributions. Entitlements for Java workloads on OpenJDK are included in a Red Hat Enterprise Linux subscription. Red Hat Middleware subscriptions include OpenJDK entitlements for Windows when used with Red Hat Middleware. For other Java workloads on Windows (non-Red Hat Middleware), an additional subscription for OpenJDK on Windows is required. The Service Level Agreement (SLA) and Scope of Coverage (SoC) for OpenJDK is determined by the use case. The SoC for Developer Support is defined here and the SLA is defined here. For production deployments of OpenJDK on RHEL and Windows the SoC is defined here and the SLA is defined here. Can Red Hat patch OpenJDK? Yes. Red Hat has the ability to provide updates to OpenJDK software shipped in Red Hat Enterprise Linux and Windows distributions subject to the lifecycle guidance provided in this article and subject to the availability of fixes in the upstream distributions. Red Hat can also backport fixes from newer OpenJDK versions to older supported versions when a fix is not provided in the older upstream version. What support is provided for Windows? Can we install multiple versions of OpenJDK on the same RHEL server? Yes, it is possible to have multiple versions of OpenJDK on the same Red Hat Enterprise Linux server as long as they are available on the media (DVD) or Red Hat Network channels. These packages are separate packages with the version number clearly identified in the name of the RPM. It is also possible for a third-party Java JDK/JRE to be installed concurrently with OpenJDK. For customer convenience, Red Hat also bundles the IBM JDK via the Supplementary channels. Note that the IBM JDK is not integral to the RHEL content set and follows IBM's guidance on updates and life cycle. We recommend you use the alternatives tool to configure OpenJDK or a third-party Java. How can I install multiple minor releases on the same server? RHEL has a proven track record of maintaining binary compatibility of key components for the life of the (major) release. OpenJDK is no exception to this rule. Users are free to stay at a particular release (e.g. "1.41.1.10.4.el6"). However, we strongly recommend that you update to the most recent release that is available. This ensures that you receive fixes to the most recent critical bugs and security fixes. While Red Hat will make a commercially reasonable effort to support the earlier release, it may become necessary to update to the most recent release to help reproduce and identify a problem. Red Hat will treat any binary incompatibility between releases as a bug and will attempt to provide a fix as per the SLA. The exceptions to this include and are not limited to our need to patch security vulnerabilities in the package with no option to avoid binary compatibility breakage. These cases are very rare and are clearly documented in the errata. How to install multiple minor versions of OpenJDK on a Red Hat Enterprise Linux system? Can we install multiple versions of OpenJDK on the same Windows server? Red Hat provides both OpenJDK 8 and OpenJDK 11 distribution for Windows servers. And running both versions on a single Windows system is fully supported. Are the binary plugs that Oracle did not release the source code for supported? The binary plugs are no longer used in OpenJDK at all as of 2010, so we do not ship any of them in OpenJDK. Does Red Hat perform the TCK compliance testing? Yes, we run the TCK test suite, which is a set of tests that we received from Oracle. Anytime there is a code change, we run the TCK to ensure that OpenJDK is in compliance with the Java specification. What kind of support does Red Hat provide after "End of Production Support Schedule"? Red Hat will provide limited ongoing technical support. No bug fixes, security fixes or root-cause analysis will be available and support will be provided on existing installations only. This is consistent with the RHEL Extended Life Phase. Is Red Hat releasing OpenJDK 9, 10, or 11? Our intent is to support Long Term Support Releases so Red Hat skipped Java SE 9 and 10, and shipped an OpenJDK distribution based on Java SE 11. See the Red Hat OpenJDK 11 Advice article for additional information. Does Red Hat provide a 32 bit distribution? Red Hat provides 32 bit distributions for Red Hat Enterprise Linux 6 and 7. Red Hat has no plans to support a 32 bit distribution in any other OpenJDK distributions. What hardware architectures are supported by the Red Hat build of OpenJDK for RHEL? The following architectures are supported for OpenJDK 8 and 11 and packaged in RPMs. The OpenJDK 11 lifecycle appears short in comparison older versions, why is that? Red Hat ships OpenJDK versions with an initial commitment of 6 years of support. We review the lifecycle regularly and can extend the lifecycle if we determine there is sufficient demand. The OpenJDK 8 lifecycle has been reviewed and extended already, and OpenJDK 11 will receive the same review later in its lifecycle. How does the OpenJDK lifecycle relate to the lifecycles of JBoss Middleware products? The OpenJDK 7 and 8 lifecycles have been updated to better align with the product lifecycles of the products in the JBoss Middleware portfolio. In general, JBoss products support more than one JVM version, and we define lifecycles to ensure that users have a fully supported stack for the lifetime of the JBoss product. Users may have to upgrade from one Java version to a newer version within the lifetime of the JBoss product. JBoss lifecycles are defined on the Red Hat JBoss Middleware Product Update and Support Policy page. Do the lifecycle dates apply to the OpenJDK images available in OpenShift? Yes. The lifecycle for OpenJDK 8 applies to the container image available in the Red Hat Container Catalog, and the OpenJDK 11 lifecycle will apply when it is released. OpenJDK 7 from Red Hat is not available in the Red Hat Container Catalog. Does Red Hat's OpenJDK distribution included JavaFX? No. Red Hat does not have plans to deliver JavaFX or the OpenJFX project in our distribution. Does Red Hat’s build of OpenJDK included Java Web Start? The OpenJDK distribution for RHEL includes Java Web Start. We are planning to add Web Start to our Windows distribution in the first half of 2019. What are the differences between Red Hat's OpenJDK distribution and the Oracle JVM? The known differences are detailed in this article. Using alternatives to manage different JDKs: What is the alternatives system and how do I configure it? Hi, I do not think the question "How can I install multiple minor releases on the same server?" was answered. Isn't the question about how to install for example Java 8u45 and 8u65 on the same server? If you want to install multiple minor release versions of the same major release, you will need to use the RPM command rather than the yum command. yum update java-1.8.0-openjdk This command will update the package, leaving you with only a single, most recent version of the package installed. rpm -ivh java-1.8.0-openjdk-1.8.0.65-2.b17.el7_1.x86_64.rpm This command should install an additional version of the package 65-2.b17.el7_1 and not update or remove a previously installed version. Note that you must first download this package to the system as rpm will not auto download it for you. You can use the yumdownloader tool from the yum-utils package to do this for you. Hi, I can't understand the latest changes on 20/June/2016. What is difference? Why does the end of support date for OpenJDK 8 (EOS Oct 2010) occur 8 years before the end of support date for OpenJDK 7 (EOS Jun 2018) on RHEL6? Is this a typo? I'm assuming OpenJDK 8 EOS should be Oct 2020 on RHEL6? Hi Rudolf, You were right: https://access.redhat.com/articles/1299013 (sorry for the delay). Hi ,Can i install OpenJDK at before RHEL 6.6 version, such as RHEl6.1,6.2? Hi Jerry, It is possible for you to install the version of OpenJDK that shipped with 6.1 or 6.2 but you should be aware that 6.1 has not been supported since 31 May, 2013 and 6.2 has not been supported since 7 Jan, 2014. A lot of bug fix and security errata have been release since then. Red Hat suggests you use 6.7 which is supported until 31 Dec, 2018 or use 6.9 which is supported until 6.10 releases late Spring of 2018. Was the "End of Support" date for java-1.7.0-openjdk on RHEL 6 just extended to June 2020? I've reviewed this page several times over the past 6months and my notes indicated an "End of Support" date as June 2018. Will Red Hat provide security patches to the java-1.7.0-openjdk software package up to the June 2020 date? Yes, it was extended yesterday. Do we still have no dates for OpenJDK 11? OpenJDK will be delivered with the upcoming RHEL 7.6 update. Users will have to upgrade to RHEL 7.6 to access OpenJDK 11. Obvious follow-up question :-) Do we still have no dates for RHEL 7.6? I'm sorry, but that's not something I can comment on. Really soon now... 7.6 has been in beta since sometime in August. This is just based on my past experience with this. Red Hat folks are very hush hush on things like release dates or even names (is it called RHEL 8? who knows). Well...Is there no schedule to be able to install OpenJDK 11 from yum repository on the environment of RHEL 7.5? If we want to use OpenJDK11, we need to update our RHEL environment from 7.5 to 7.6 or install the binary from official...Isn't it? But at the present I think that on 7.5, to continue using OpenJDK 8 is better, because of its support till June 2023. OpenJDK11 has become to be able to install from yum repository as of November 2, 2018. My desktop environment might be upgraded from 7.5 to 7.6 by previous update. If your desktop environment is still 7.5, please use this command in your shell. and then, type below...you can confirm OpenJDK11 at yum repository. # yum list | grep "openjdk"
Here is the announcement updated Nov 1, 2018 by Red Hat. Here is the way to upgrade OpenJDK. Thank you Red Hat staff! Ah...Red Hat has still been supporting OpenJDK 8...Stupidly, I installed the binary of OpenJDK 11 from oracle official. There have been another easyway... Thanks! Hi, I see that the "OpenJDK Update Release Dates" are exactly the same as Oracle. Do you mean that RH typically have their openjdk packages available for deployment or download (Win) on that date? My experience is that the security advisory and packages trickle in a few days later (first RHEL7, then RHEL 6, etc . . ) . If that is the case, then it would be cleaner to list these RH dates instead. Can one assume that the latest OpenJDK version available for RHEL is the same as what is available for download on the Windows page? I have not been able to locate a place to download an RPM for OpenJDK...is it possible to install openJDK offline? Yes, Windows binaries are built from the RHEL RPM source packages. You should be able to download if from the Red Hat Customer Portal if you have a proper entitlement (e.g. RHEL). Is there a way to see what change(s) occurred? I'm following this article and get frequent notices that a change was made but don't have a clear way to see what changed unless it's a comment where I can see an actual date. Does this RedHat support mean that OpenJDK will be supported in both RHEL and CentOS?